Therapeutic Specialist, Therapeutic Services Canberra. Video games aren’t all bad. Many people are able to enjoy them and curb their use, maintaining social interactions, relationships, personal hygiene, school, and physical health, while still holding other interests. However, for some people, this isn’t the case. Video games become all encompassing, stealing more and more time away from friendships and other activities the person once enjoyed. Even when they are not playing them, they wish they were, preoccupied with cravings about the next time they can log in. Unsurprisingly, gaming can release dopamine that is comparable to the effects of psychostimulant drugs on the brain (Han et. Al, 2012). When psychostimulants are used routinely, the sensitivity of our natural reward system decreases (Weinstein, 2010). So, what does this mean? Basically, if your mind’s reward system is desensitised, doing things that don’t offer similar levels of immediate dopamine release (like playing a board game, doing a craft, or going for a walk) isn’t going to be as appealing. Issues arise when the amount of time some youth spend playing video games starts to interfere with normal developmental milestones. All of those things young people would be doing, such as face to face or group interactions, playing sports and doing other activities are restricted when someone has a serious addiction to video games. A diagnosis of Internet Gaming Disorder would require five or more of these symptoms to be present within a year. Human beings have an innate need to bond and connect. When we don’t meaningfully connect with others or have much to enjoy in our environments, it becomes natural to seek out a connection in alternate ways such as video games. Moreover, as Gabor Mate suggests, if a child is abused or neglected, it impacts the child’s brain development in a way that makes them more prone to addiction. In essence, the child often seeks and finds different ways to soothe the effects of childhood trauma (2013). Playing video games for some young people may become a coping and soothing strategy; it provides a surreal escape from their sense of reality and allows them a chance to interact safely and feel connected, without the full proximity of real-life interaction. 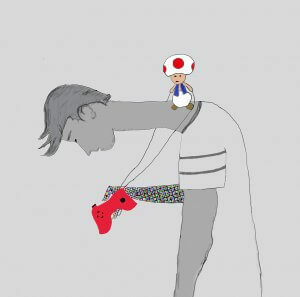 Due to these elements, for young people who have experienced trauma or have attachment disorganisation, video games can be especially alluring (Schimmenti et al., 2012). They are provided with a place where they can forget their trauma and feel safe in a world they have control over. From here it becomes a question of moderation; too much time invested can lead to disconnection from reality, whereas low levels of use can potentially have prosocial outcomes (Przybylski, 2014). Young people who are addicted to video games are possibly lacking connection in other areas and are using video games as a replacement. Therefore, what are some ways they can connect with you/others? Build rapport and provide empathy around the use of video games. For some youth, video games will mean the world to them, and if you don’t understand this or criticise them, they will only see you as someone trying to stop what they love. This might involve gaming or watching the young person game and stepping into their world before you can give them advice. Offer some light psycho-education conversations on what video games can do to our brains and why it’s so hard to stop playing them, as well as why they feel irritated when they have to stop. Create other goals for different activities and hobbies with the youth. This can be a key component for stopping video game addiction where they experience real life achievements and recognise the pleasure they get out of other activities, friendships, and hobbies. This will take some encouragement and patience, as these activities will be competing against the instant and lasting dopamine surge of video gaming. Maté, G. (2013). In the realm of hungry ghosts: close Encounters with addiction. Toronto, Canada: Vintage Canada. Schimmenti, A., Gugliemucci, F., Barbasio, C., & Granieri, A. (2012). Attachment disorganization and dissociation in virtual worlds: a study of problematic internet use among players of online role-playing games. Clinical Neuropsychiatry 9(5), 195-202. In a recent interview (WNYC, 2016) with comedian, television and movie actor Michael Ian Black, I was struck by just how traumatized during childhood he seemed. Yet the word “trauma” was never uttered. This blog is the second in a series of daily blogs being published during the 2018 International Childhood Trauma Conference. Each day a member of the Australian Childhood Foundation's Senior Executive will share their reflections on the content in sessions they attended. Today's blog is written by Noel MacNamara, Executive Manager Research and Policy.